When it's hot in Las Vegas one would think the last thing I'd want to have for lunch is hot soup. 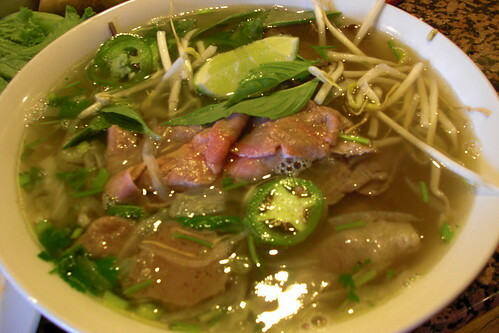 But if it's a big steaming bowl of phở, I can have that anytime--hot or cold outside. So my sister, Tom and I drove to China Town to Phở Kim Long on Spring Mountain Road for lunch. 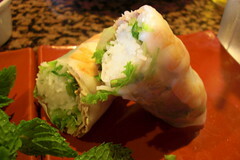 The spring rolls are always an excellent appetizer choice and egg rolls. 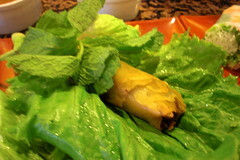 Something I've never tried before was wrap the egg roll with mint in a lettuce leaf before dipping it into the sweet and sour peanut sauce. You must try it--it is GOOD that way!! Up until my sister introduced this way of eating an egg roll, I was never a big fan of those fried things. Bea ordered young coconut juice served in a fresh coconut shell from which the tender meat could be scraped off and eaten afterwards. That was really good too. Of course the phở is always tasty. The broth ends up being red from all the hot sauce I put in it. Lunch was great as usual. We left so stuffed! All I wanted to do was go home and take a cat nap.